I moved to Charlotte from Los Angeles back in March 2016 and although I haven't even lived here for a year yet, I've covered a lot of ground, food-wise. I love eating & I especially love fresh & healthy ingredients, but I like to splurge now & then. Below are the BEST & most memorable meals I've had in CLT so far. Fellow Charlotteans, please feel free to comment with recommendations because I'd love some new places to check out! 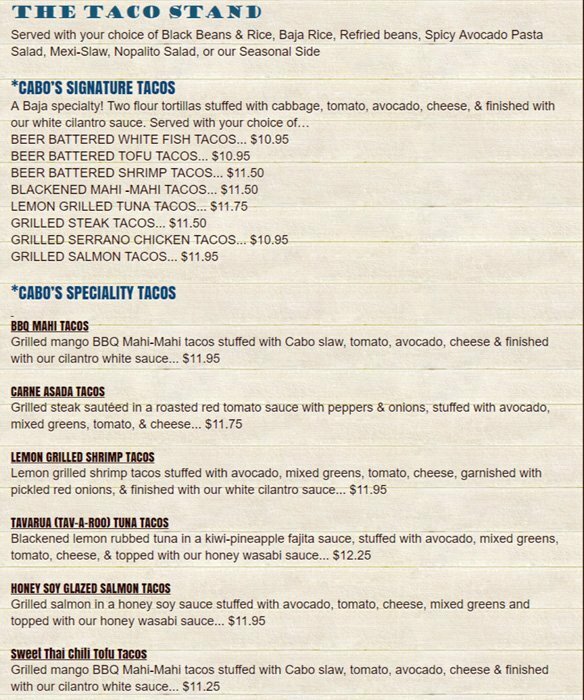 Cabo Fish Taco in NoDa hands-down takes the cake for tacos & honestly, their Honey Soy Glazed Salmon Tacos are probably my favorite tacos on the planet. I love a good street truck taco in LA, but these are the most delectable tacos I've ever tasted. With grilled chunks of salmon, avocado, cheese, & a honey wasabi glaze, my mouth is watering just thinking about them. Their pico de gallo with corn is the perfect precursor to the meal as well. Honorable Mention goes to RuRu's Tacos & Tequila for all of their tacos, especially the Stage Five Clinger (crispy chicken spicy corn relish, pickled jalapenos, & chipotle aioli). Nikko Japanese Restaurant & Sushi Bar in South End has one of the best sushi boats I've ever had. Nigiri is my favorite & theirs is so fresh & delicious. The atmosphere of the restaurant is great too. Honorable Mention goes to Ru San's for a lower cost alternative with equally awesome sushi. The Kiss of Fire Roll is my favorite but I've never had a bad one (& I've tried almost of all of them!). This one is a tie between the Juice Bar in Park Road Shopping Center & Rico's Acai at 7th Street Public Market. I get the 'Acai Bowl' at the Juice Bar & it's a mixture of acai puree, banana, & organic almond milk, topped with granola, almond butter, strawberries, blueberries, banana, chia seeds, hemp seeds, coconut flakes, cacao nibs, goji berries, bee pollen, & honey. What I love the most about this one is all of the toppings, especially that it includes almond butter, cacao nibs, & goji berries, in addition to fresh fruit. At Rico's, I always go for the Rainbow Bowl which is acai puree, topped with granola, bananas, strawberries, pineapple or mango, kiwi, blueberries, & raspberries. The bowl looks like a rainbow & is the best when you're craving fresh fruit. One of the biggest surprises I found when moving to Charlotte was that there even was a place to get ramen. Futo Buta in South End was one of the first restaurants I went to when I got here. I have a deep ramen obsession and never thought I'd find anywhere that could even halfway compared to Silverlake Ramen in LA (if you haven't been, GO next time you're in LA!). Futo Buta was such a pleasant surprise. It's different than what I was used to, but incredible & not one of their bowls has disappointed me. My go-to is the Miso, but I've had the Tonkotsu & Chizu, both of which are also awesome. And, I always add the spicy ground pork to any bowl. They have delicious Pork Belly buns & a less traditional, but surprisingly yummy, Duck Confit bun. Try the Fried Brussel Sprouts, Rice Crispy Squares, & Salmon Belly Nigiri too. There's no honorable mention for this category because I've yet to have ramen anywhere else... if anyone has a suggestion, comment below! The Cellar at Duckworth's is an underground spot with a speakeasy feel & spectacular food. A good charcuterie is one of my favorite ways to start a meal & they have an excellent selection of local cheeses & meats at The Cellar. The best part of my meal was definitely the House Made Waffle Cones, a small plate with 3 waffle cones stuffed with ponzu poke tuna & macadamia nuts, coconut shrimp, & chicken, sriracha honey, & bacon. We also had the burger & shrimp & grits, both of which were fantastic. Honorable Mention goes to Customshop in Elizabeth for their Charcuterie, Spicy Tuna Meatballs, BBQ Octopus, & Crispy Brussels Sprouts. Love the vibes there as well. I realize that I may make you all question why on earth I have any business judging & recommending food with this statement, but I have no shame. I LOVE Domino's Pizza. I've loved it since college & I wouldn't dare order from Pizza Hut or Papa John's or any other chain, because the thin-crust Jalepeno, Pineapple, & Pepperoni pizza at Domino's can't be beat. With that being said, once I tried Zablong Peculiar Pizza in Latta Arcade, I suddenly forgot all about Domino's. Zablong is probably the best pizza I've ever eaten in my life. I love the oblong shape & thin crust, plus the fact that I can add infused oils, fresh basil, argula, olives, goat cheese, or honey (I'm not sure why anyone would but I like the option) at the end. I've had The Vampire Slayer, The Misfit, & The Tree Hugger, & they're all incredible. Now, I haven't had a ton of wings during my time in Charlotte, but I won't go anywhere else to even try them since I tasted Seoul Food Meat Co.'s wings. I love traditional Korean food, but that's not what Seoul is. It's Southern BBQ with a Korean flare. Their wings are Korean-style, double-fried (!! ), & covered in either spicy BBQ sauce or soy garlic sauce. I love them both but the soy garlic tops the spicy for me, just slightly. They're sooo crispy, soooo delicious, & I promise you won't be able to get enough. My other favorites at Seoul are the Ramen Mac & Cheese (I've already told you my love for ramen) & the Kimchi Brunswick Stew. My favorite part of any meal. I don't like dessert unless it involves chocolate or ice cream. On a quest to find the best ice cream in Charlotte during the hot summer months, I went into Elizabeth's Creamery & my life hasn't been the same since. It's a family owned shop with homemade ice cream & waffle cones & I meant it when I say, it's to die for. My favorite flavors are the Fudge Brownie & Banana & I get one scoop of each piled into a fresh baked waffle cone. Honorable Mention for dessert goes to Crave Dessert Bar. I love the atmosphere & the big comfy couches & cool cocktails, but what I love the most are their s'mores. They bring out a small fire pit plus marshmallows, Hershey's milk chocolate, & graham crackers. Be sure to get a reservation, especially if you plan to go on a Friday or Saturday night. The Secret Crush is my favorite cocktail, probably because it smokes & is topped with a childhood favorite, rock candy. Thanks so much for reading! Subscribe on the right so you don't miss a post & follow me on Instagram @blondeandbubbly for more updates!